This time it is for real. After several times Marvel had teases us with artworks, stunt men's in costume and close shots of Evans, now it is really for real. 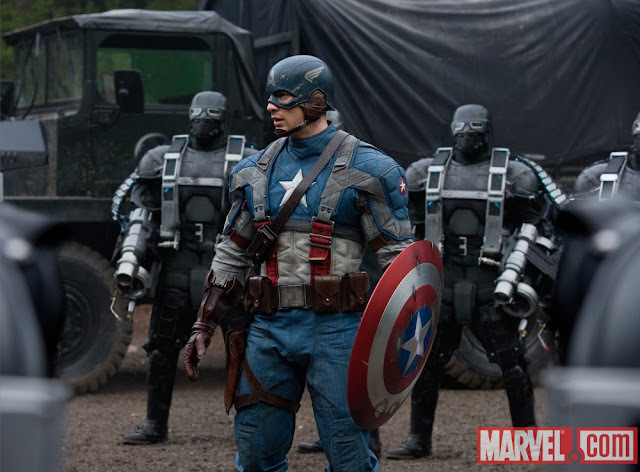 Chris Evens wearing the Captain America Costume in full gear. It is good to finally see Chris wearing the costume with the helmet/mask. But with the release coming very soon in several months, they should release more shots (presumably more different angles) so that we can have the final verdict if it is really good. It is really hard to judge the costume with this single shot. But so far so good. Or better yet release the trailer as soon as possible. Oh Marvel, please hear our call.